NES Kiwi Kraze: A Bird-Brained Adventure! (USA) in 02:24.28 by Max12187566 & J.Y. In this game, you control a kiwi bird and rescue other kiwi birds trapped within the level. 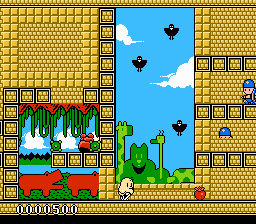 There are numerous warps, used to cut this game many minutes short of its expected completion time. The ceiling and wall physics are very similar to Bubble Bobble, which means some of them can be passed through when you wouldn't expect it. In addition to this there is a glitch that sends you through the floor, saving a lot of time in the final stages. The first submission was almost 14 minutes long and thought to be optimal, and now we are below 3 minutes.